old fat slow guy looking for "team" slot. Thread: old fat slow guy looking for "team" slot. so i'm about to register for the race. my team defected to a road race, so i was all about going solo, and will if necessary. but i thought i'd offer myself up to a team needing one more, or a partnership. i ride ss and drink a lot of beer. am completely un-race-trained this year, but _have_ practiced the beer thing. i have a little enclosed trailer that i usually sleep in. it's _not_ a camper, but beats sleeping in the truck sorta. still brazing on the bike...hope to have paint on it by race day. it's almost done. true temper 9/6/9 double oversized-1.25/1.375, c-04 low-fuming bronze, gasflux paste, oxy-acetylene. except for the stainless bits (paragons/braze-ons) -- 50n silver. just trying to get something on the ground so i can ride. have redesigned this one too many times... and it's not going to be nearly as pretty as my road frame*. (which may be on here somewhere, i have a link to the painting of the roadie on fb) version 1.1 will get a less hurried build with mostly the same components save the dropouts and seat stays. plan to build curved/segmented sstays. *columbus spirit for lugs/sachs lugs/lcb ss dropouts/56%silver. and still due a lugged fork/stem. wrt o/p. i'll solo. maximum exposure whoohoo. are you entering the ss division or are you willing to ride with a geared rider? oh, i'll ride _with_ anybody, just don't ask me to swing my leg over a geared atb. hey any more frame questions? looks like dsg may be the first outing for the danged thing. r&d baby! that makes it a business expense. They should have a division for frame builders. You can only race in this division if you built your bike yourself. now that would cut down on the field. most of my builder bros race--but they're hundreds and thousands of miles away for the most part. "hey any more frame questions?" sure. did you go with verus, verus ht, ox? 26" or 29". i assume you got your tubes from HJ (great guy). is it a lugless BB? dropouts or frame ends? i'm sure you already know this, but pacenti has some nice mtb lugged fork crowns. verus. no need in wearing out my files prematurely. 26" to fit components (wheels/fork) in my possession (cheaper). hank and monica, yep. going to get his access 65 asap! paragons-omfg not for beginners. all fillet brazed-no lugsatall. i may do some "bilam" in the future, especially for 29 and long-travels. love the crowns, but don't have a non-suspension app for them yet. (i'ma wuss). speaking of pacenti, i really really want to build a 650b. seems to be the best option for the most riders. what is your familiarity with the process yo? pm if you care to. Last edited by WadePatton; 05-02-2010 at 01:00 PM. yo, i'm registered with carter. we a duo. now turn offa the spigot!!! glad you found a team. i have been researching steel frame construction for a few years - played around with lugged frames. would like to figure out how to build a lugged 29er. 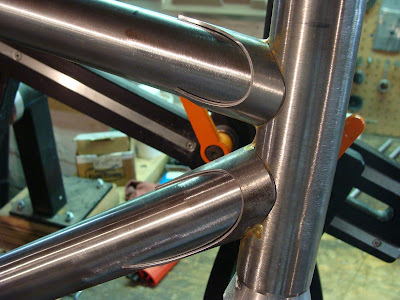 i also would like to try fillet brazing, but dont have proper torch for that. looking at oxy/propane setup. but mostly my interest is plain ole curiosity. very cool. they've a sycip up on the wall at the lbs (moab) with some of richard's lugs. i have two sets of the same lugs (but not ss). will use them on my next roadie--which will be a flip/flop/v-brakes/fattish tire rig. for gravel roads and maybe a little 'cross. but i'm nuts about getting a better looking atb done after hacking my way through that one. love the fillet brazing, but it's a huge chore to clean up/fix up. none of the chit is as easy as it looks. i've met nearly all of my builder hero/mentors either online or going to nahbs. as soon as i get electricity and a driveway-my shop will be open to any interested folks nearly anytime. (word _will_ get out). the atb is "at paint". i should get it back mon/tues, then i build it, ride it, race it. going to re-do the same hta/sta but probably do it with a longer f/c. and probably with a different "sliding" dropout. as much as wheel size experimentation appeals to me, tooling is where my money must go. using bikecad, have surface plate, need jiggery. ---and to build a lugged 29r, start with proper atb lugs usually sans c/s sockets. then you'll have to heavily modify them for the proper angles. and i mean heavy. pm for destructions...(not that i know much, but will share). Last edited by WadePatton; 05-05-2010 at 08:38 PM. i suspect it would involve curved tubes and maybe home made lugs. ive seen some with straight tubed lugged 29ers for non-suspension fork (i mean minimum a-c). curved tubes will complicate matters. it's all been done. trust me. "bi-lam" gives the lugged look w/o the angles hassle. i like the low mount disk tabs on the dropouts. i wonder why paragon doesnt make track ends with low mount disk (like on-one has). seems like a good solution to the SS/disk brake issue. did you use paragon sliders? yes, going to love that change if nothing else. can also use q/r hub now.